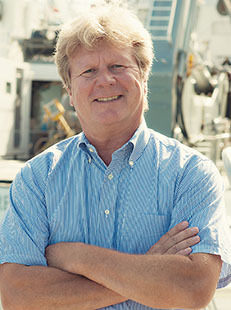 Bill Curry joined BIOS in 2012 as President and Director. Prior to joining BIOS he was a Senior Scientist in the Department of Geology and Geophysics at the Woods Hole Oceanographic Institution (WHOI) and the Director of the WHOI Ocean and Climate Change Institute (OCCI). Curry has twice served as a Program Director at the National Science Foundation in the Division of Atmospheric and Geospace Sciences – from 1988 to 1990 and again from 2011 to 2012. From 1995 to 1999, he was the Chair of the WHOI Department of Geology and Geophysics and he served as the OCCI Director from 2001 to 2005, and returned to the position again in 2007. He served on the Ocean Studies Board of the National Research Council for six years as well as numerous National Science Foundation (NSF) and National Oceanic and Atmospheric Administration (NOAA) advisory and review panels. In 2004, he was elected Fellow of the American Geophysical Union (AGU).